Our Four Leaf Clover Necklace is inspired by days spent hunting for four leaf clovers in the wilds. The four leaf clover is a universally accepted symbol of luck and fortune with its origin ages old. A common belief during the Middle Ages was that a person who carried the rare four leaf clover would have the ability to see fairies. The mystique of the four leaf clover continues today, since finding a real four leaf clover is still a rare occurrence, in part because of its rarity in nature. It is said that chances of discovering a four leaf clover in the wild is 1: 1,000,000. Four Leaf Clover Necklace, for that one in a million. Legends have it that each leaf of the Four Leaf Clover is said to represent something; the first is for faith, the second for hope, the third is for love and the fourth for good luck. We have carried this very sentiment in the design of our Four Leaf Clover Collection with each little leaf cast in the shape of a heart for that added bit of love. According to superstitions, finding a four leaf clover means the person who found it will meet his or her future lover that very day. Another belief states that if you give a four leaf clover to someone else, your luck in love would double. Get lucky in love with our Four Leaf Clover Collection. 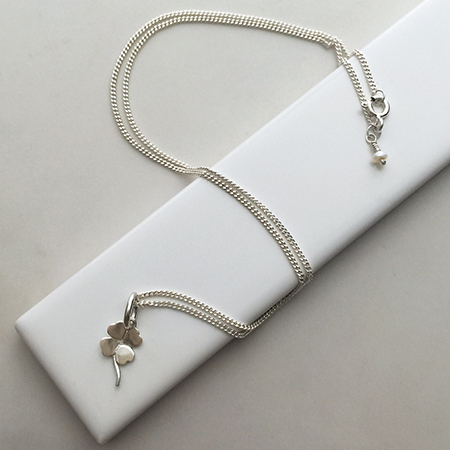 Four Leaf Clover Necklace makes for the perfect gift for someone needing a little bit extra luck in their life. New Home, new job, new school, exam lucky charm? Give someone that special boost into their new life stage and give them the great encouragement in the pursuit of their dreams with a piece from our Four Leaf Clover Collection. Wish them the best of luck. Four Leaf Clover Necklace by Bianca Jones Jewellery, for that one in a million.